The act of travelling is one that builds value, to the lives of the traveller – enriching you through unforgettable experiences and the creation of lasting memories. One of the misconceptions about travel is about the impact the money spent on tourism by the western and privileged traveller has on the places they visit. Whilst tourism most definitely impacts local economies and has done so for many centuries in terms of often creating employment, infrastructure and contributing income, the amount invested in the social or into the environment and social is often disproportionate to the final sell price. 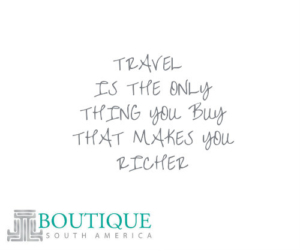 Whilst responsible tourism and travel initiatives are now new, at Boutique South America we are putting our own different spin on this concept. 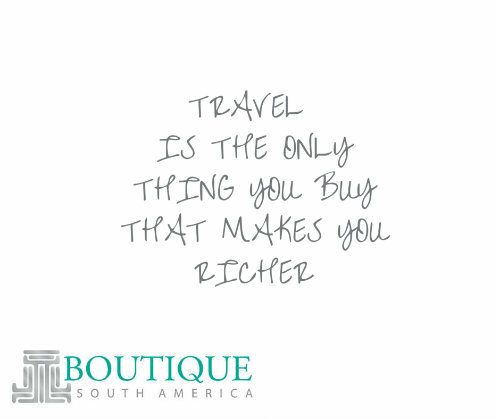 Boutique South America believes that consumers are becoming more informed about their purchasing choices and that support of forward thinking, positive and sustainable can contribute to the decision making processes of travel buyers. We also believe that Responsible Tourism is no longer nor should it just be the domain of a handful of tourism suppliers or the minority of the industry. All travel sellers should be assessing how they can make change to or innovate their business practices, including that of stakeholders/ suppliers as well as directly contributing to the the communities and destinations they service. Considered Tourism includes conscious and considered approaches by each stakeholder in the tourism economy, encouraging and promoting responsible tourism practices throughout the various stages of the tourism supply chain: that of the initial business in it’s day to day operations, that of the suppliers involved and how they conduct their services, to the community or locals of the destinations and areas we promote, right down to the consumer who actively chooses to purchase from companies that align with their values. We take our role as conduits to conservation seriously and focus on providing experential programs in biodiverse environments, where you will learn, interact and often give back as you travel. We feature and choose to use lodges and hotels that have a sustainability ethos and take measures to support and protect the local and often unique environments they serve. We endeavour to educate Australians about the wonders of the unique environments within South America, highlight the challenges faced by certain species and ecosystems and support and promote initiatives to support conservation efforts. We choose to provide unique interaction with local communities as part of our touring programs in different places, which means working with them so they can meet and teach travellers about their customs, which then helps preserve their traditions and educate another generation as well as offer a financial renumeration. Boutique South America partners with Global Giving to directly impact worthwhile projects and causes in South America. Every 6 months we feature one project to support and US$20-25 from each booking is donated to this project which the company matches. That way you can ‘Travel Good and Do Good’ in a positive way and we match these amounts. We work with suppliers in South America not only because they have great knowledge but also because this employs local people. We alsp use local but professional guides throughout to give you, the traveller extra insight and perspective as you travel. We favour working with suppliers who are sustainability focussed, many of them who run their own ‘give back to the community’ and education programs. Within our business operations me make positive choices in our operation, e.g. our focus on the online medium vs. the printing and distribution of travel brochures, the choice to use recycled paper where possible (which should be mandatory really) and even choosing to offset the carbon we generate through our own business travel. Whilst some of these changes may only be small and seem inconsequential compared to many issues facing the tourism industry, we believe that when people across all levels take responsibility for their choices and consciously pursue change, this is when their actions are most powerful.